My favorite travel buddy, Suzanne, and I both love riding on vintage trains and tasting wine. So during our last trip to California wine country, we combined the two and enjoyed a journey aboard the Napa Valley Wine Train. It was a welcome change: We’d already spent two days navigating Napa and Sonoma on our own, which meant we had to take turns as the designated driver (the one relegated to filling the spit bucket rather than savoring full sips of wine at each winery). We’d also had to time our itinerary to avoid peak traffic periods. With most tasting rooms in Napa located on two main roads, driving required plenty of time and patience, even during nonpeak season. The train eliminated those challenges, allowing us to fully enjoy a wine-tasting experience together. Suzanne and I planned to spend the night and enjoy dinner in the city of Napa after our journey, so we booked the Wine Train for lunch and left our car at the hotel. The weather was bright and sunny when we set out on the 10-minute walk from downtown to the McKinstry Street Station for an all-aboard time of 10:50 a.m.
We found our car and climbed up the old-fashioned metal steps, not quite knowing what to expect. Would the vintage ambience be stuffy — or worse, tacky? Not a chance. The posh, early 20th-century decor was tasteful, lovely and inviting — the perfect setting for a beautiful day that was about to unfold. Some of the Day Tripper journeys return to Napa by bus, while others include roundtrip travel on the train. The most affordable options are the roundtrip Gourmet Express options at both lunch and dinner. 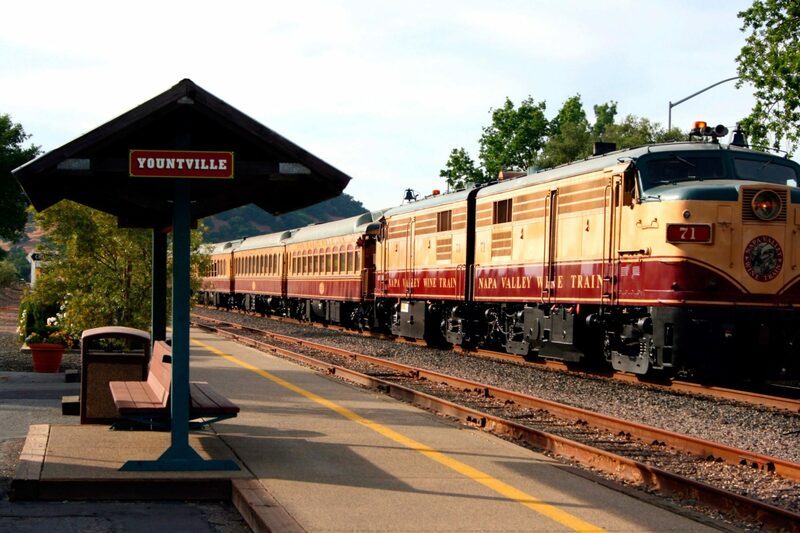 The daytime expedition seemed like the perfect option for admiring Napa Valley’s scenic beauty — and for two friends not keen on being surrounded by starry-eyed couples aboard the Romance On The Rails dinner journey. 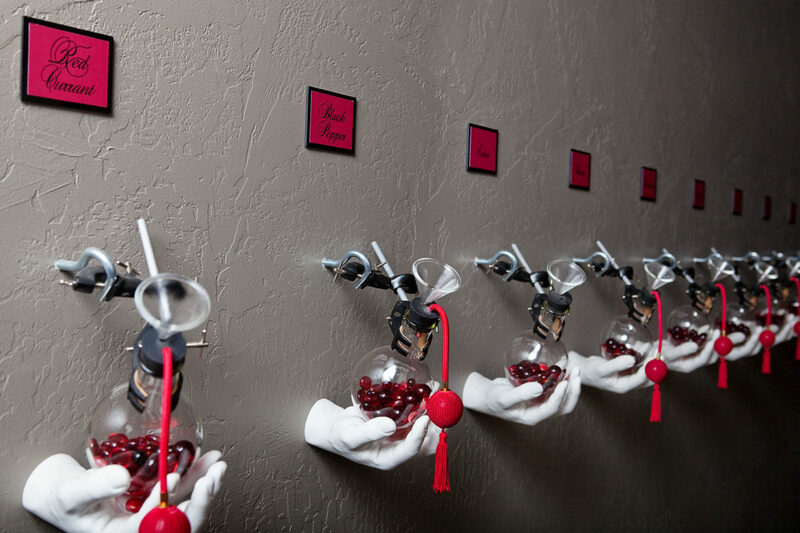 After checking out the four choices in the Day Trippers category, we booked the Ambassador Winery Tour. It included a three-course lunch served during a 1.5-hour train journey north to St. Helena, followed by visits to two wine estates: Raymond Vineyards and ZD Wines. (The latter destination has since been replaced on the itinerary by Charles Krug Winery — the valley’s oldest tasting room, dating back to 1882). Afterward, we’d board a bus for the ride back to Napa. All Wine Train passengers age 21 and older enjoy a complimentary tasting of a private label red or white wine during lunch. But, for us, it only lasted through the first course, which was a zesty goat cheese and fennel salad or the soup of the day. So Suzanne and I each purchased a second glass to complement our entrees (a choice of beef, pork, chicken or two vegetarian options). After all, drinking wine without a care in the world was the whole point of the journey! The dishes were all flavorful and well-executed. But it was the plush surroundings, gentle rhythm of the train and beautiful scenery that made the overall dining experience immensely enjoyable. If you have a favorite bottle of wine — or an extra one that you can’t possibly fit in your suitcase on the way home — bring it on board with you. You’ll be able to enjoy it during your lunch or dinner for a $15 corkage fee. 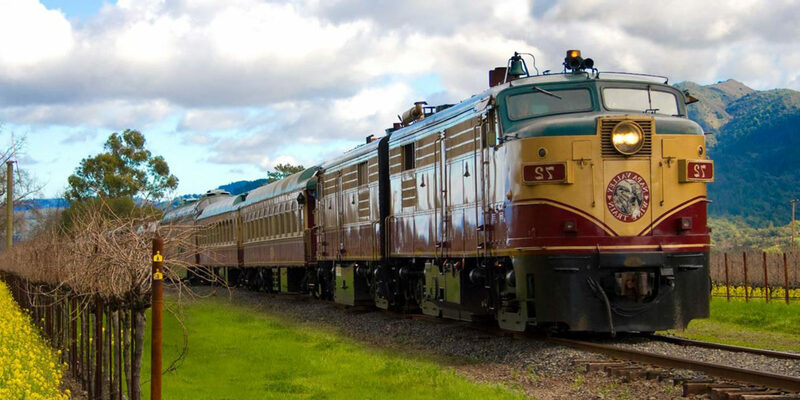 The Wine Train consists of vintage train cars — most of them Pullmans dating back to 1915 — with all the charm and detail you’d expect of the era. 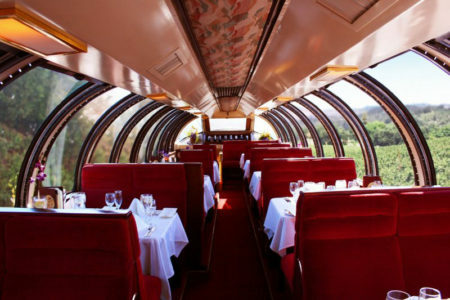 For dinner, we sat in the Le Petit Gourmet Dining Car, originally built for the Northern Pacific Railway. It was suitably opulent, with salmon-hued velvet, dark mahogany and polished brass accents. At dessert time, we were led through a hallway in the Le Chef de Cuisine Kitchen Car, where we could peek through windows to watch the chefs at work. Then we arrived in the Merlot Lounge Car, where a dozen comfy swivel chairs beckoned us to sit and enjoy a chocolate confection and coffee (or more wine) before we pulled into St. Helena and disembarked. We experienced a complete 180 from the Wine Train’s retro ambience as we boarded a modern motor coach for our winery visits. But the charm returned in short order when we arrived at Raymond Vineyards, which is about as whimsical a winery as you can imagine. Founded in 1970, it’s also notable for being organic, biodynamic and 100-percent solar-powered. Before Suzanne and I even got to the tasting room, we admired the delightful gardens, quirky al fresco artwork and menagerie of farm animals. Later, we found the wines to be smooth, balanced and thoroughly enjoyable. 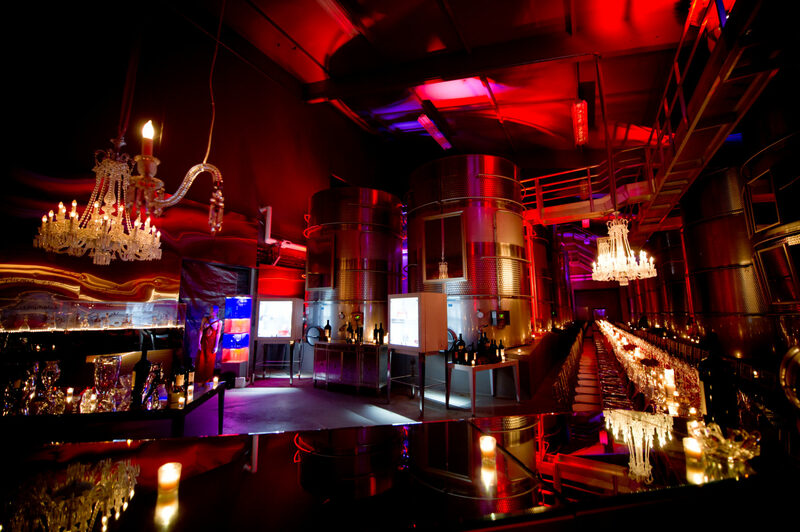 But it was the vibe inside that truly stunned us: dark and seductive, with tufted red velvet upholstery, over-the-top crystal chandeliers and vampy mannequins posed on trapeze bars. I wish I could describe the experience at ZD, but unfortunately we never made it there. A serious traffic accident shut down a portion of the Silverado Trail just before the winery entrance, forcing our bus to turn back toward Napa. But the staff offered everyone a partial refund, and even without the second winery visit, the day was more than satisfying: five hours of delicious sips — and not a single one ended up in the spit bucket! The Wine Train runs just one daytime and one evening departure per day, so book well in advance, especially for weekend tours. Find a wine tasting experience or culinary tour available through the Marriott Vacation Club DestinationsTM Exchange Program.